Big news on the “hey, that’d make a good tablet!” front: Google confirmed that they have acquired BumpTop, makers of a sort of 3-D desktop replacement software. Android? Chrome OS? Who knows? It’s one of the better implementations of a touchscreen desktop I’ve seen. 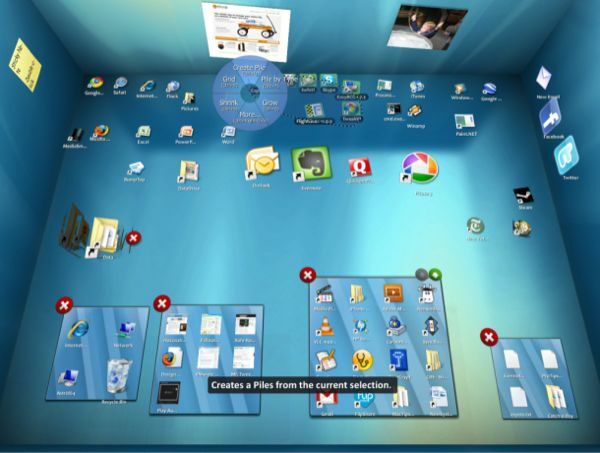 It’s easy to use, though not all of its gestures and features are immediately obvious, and certainly feels more natural than trying to navigate a stock Windows 7 desktop. Google‘s purchase was rumored at first (BumpTop posted an announcement that the product would shortly become unavailable as it will be going “in an exciting new direction”), and later confirmed by TechCrunch. It’s a very evocative purchase; you can see just how useful it would be to Google, which has leapt into touch-based technologies but isn’t exactly a master of touch-based interfaces. So, what might Google do with BumpTop? I think it’s safe to rule out Chrome OS as an eventual landing place–Chrome OS will likely still rely on a keyboard and mouse, and will regardless focus more on the browser than on file management. Nor do I think it’s likely to be offered as a standalone. BumpTop is likely due for Android, and more specifically for Android tablets. Most upcoming tablets will be looking to Android (with the possible/hopeful exception of HP, which may come out with a WebOS tablet). But on a bigger screen, Android’s rough edges are pretty obvious. A skin, like HTC’s Sense or Dell’s Stage, is one option, but BumpTop might be a better solution. It’ll need some tweaking (it doesn’t have any of Android’s hallmark and completely essential UI features, like the notification shade or app drawer) but it has the potential to offer something really different for an Android tablet.